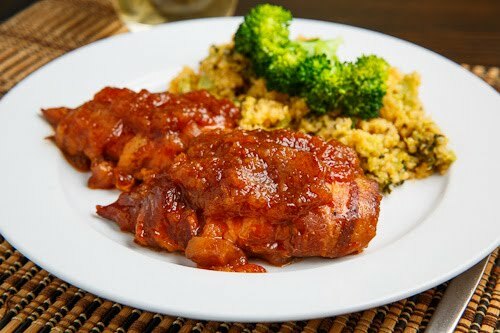 Bacon wrapped chicken breasts in a sweet and tangy apple BBQ sauce that is super easy to make and addictively good! I have had a slow cooker for a few years now but I find that I hardly ever use it and when I do it is usually for things like pulled pork. I almost feel like I need to justify it taking up space when I have so little so I am always on the lookout for good slow cooker recipes to give it a workout. I recently came across a this tasty looking recipe for slow cooker bacon wrapped apple BBQ chicken on Chef in Training and with apples in season it seemed like the perfect chance to pull my slow cooker out! I mean you really cannot go wrong with BBQ chicken and if you then throw apples and bacon into the mix things can only get better! One thing that I do like about slow cooker recipes is that they are generally really easy, sometimes being as simple as throwing all of the ingredients into the slow cooker and turning it on and then you come home to a fully cooked one pot meal. This recipe is only requires you to dice some apples and wrap the chicken in bacon so it is easily doable even on a busy weekday morning and it is so worth the ten minutes of effort! 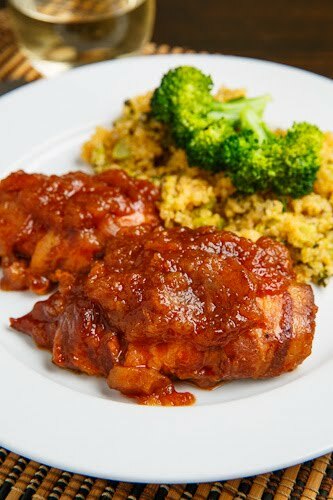 The chicken comes out nice and moist and tender and the flavours of the bacon have melted into the chicken and BBQ creating one really tasty dish! 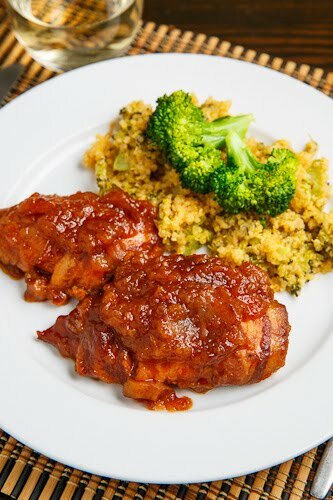 I served the slow cooker bacon wrapped apple BBQ chicken with some cheesy broccoli quinoa (recipe coming soon). Wrap each chicken breast in 2 slices of bacon and place in a slow cooker. Mix the BBQ sauce, apples and lemon juice and pour it over the chicken. The flavor combo sounds yummy, but cooked this way the bacon will not only not be crisp, but sounds like it would be downright flabby – how did it really come out? I'm dying to try it, but this is the one sticking point. The bacon is not going to come out crispy from the slow cooker, as it taps in so much moisture. You will have all of the amazing bacon flavour but not the crispy texture. This looks really tasty, but small boneless chicken breast on high for 8 hours? I did a 4 pound pot roast last night in the crock pot in 3 hours on high. I bet this could be done in two hours max or 45 minutes in the oven at 350. Love your recipes .. this one seems off on the time in the crockpot. Did you use your Ninja for that? Keep the slow cooker recipes coming Kevin! I'm determined to use my slow cooker more often and this is a perfect recipe to start with. I'm definitely gonna give this a try! Always looking for new slow cooker recipes. This looks so good ! Plus sounds easy to make which is the best ! I have to try this !!! Thanks Kevin !! Could you use some chicken thighs instead of boneless skinless breasts? I just bought some and this would be perfect because I have everything else on hand. thanks! The combo sounds like a winner. You are right you can't go wrong with barbecue chicken. Anonymous: Yes, this recipe easily doubles by doubling all of the ingredients. Enjoy! slywlf: The bacon is there for the flavour and not for the texture and it will not be crisp. The bacon pretty much melts into the chicken infusing it with its flavour! Jess: Chicken thighs would definitely work and they have more flavour that the breasts! Peabody: The Ninja would be perfect for this! I recently got a slow cooker and must try this recipe! Chicken wrapped in bacon MUST be a winner! Thia looks good, though the bacon is basically just for the flavor, when I make this recipe I will par cook the bacon. Where can I find the nutrician value? In the crockpot now. I'm trying it with skinless thighs. Fingers crossed! I made this today and am so disappointed. It was pretty much inedible. What a waste of money and food. I don't know what I did wrong. Sorry, but yuck. Autumn, thanks that as helpful!! Currently cooking this and the problem I'm seeing is the potential of bacon grease. Either the sauce is breaking down, my chicken wasn't fully thawed (it had no ice when I cut the breasts in half to accommodate the size of my small slow cooker, so I'm assuming that wasn't the problem), or the bacon grease is making the sauce extremely watery. Do you just serve the barbeque sauce with the bacon grease in it? If not, how do you separate the barbeque from the bacon grease? Tiffany: The sauce should end up being pretty thick. It sounds like your chicken might have had a lot of water in it. I serve the sauce with the bacon grease in it as it adds flavour but it does add calories. tried it. was left with a greasy, watery sauce and the bacon was hardly edible. Anonymous: What kind of apples and bacon did you use? 2 smal breasts for EIGHT HOURS?! Anonymous: This dish does not need the 8 hours, the 4-6 will definitely work and the apples will retain more of their texture with the reduced cooking time. I normally make this dish on weeknights so I put it in the slow cooker before I go to work and then pull it out when I get back, which is often closer to 10 hours and it has never burnt on me. Were there a lot of liquids (the apple bbq sauce) left in the slow cooker when you pulled it out? I made this recipe with four breast, doubled everything omitted nothing and added nothing and it was DELICIOUS!!!! The bacon adds a great flavor to the sauce. Would you recommend browning the chicken and half cooking the bacon to reduce the amount of fat from the bacon as well as getting rid of some of the water from the chicken or is that unnecessary? Also, would it be ok to prepare the dish half way (like cook for 3-4 hours), refrigerate, and then cook it for a few more hours the next day to finish? Or maybe even sauteeing the apples in a pan before adding to the crock pot? Kyi: You don't need to pre-cook the chicken but partially cooking the bacon will help remove some of the fat before adding it to the crockpot. You can cook it half way one day and finish it the next. You should not need to pre-cook the apples as they will be done before the chicken. I am going to try this for my super Bowl Sunday Meal. zelryn: That should not be a problem. Even if the sauce is a bit more liquid-y it will still work and be good! JessA: Yes, it sounds like something went wrong there! I have never had the chicken go hard! The moisture trapped in the slow cooker should ensure that everything was nice and moist. Could the lid have been ajar? Kayla: I have never tried from frozen so I would recommend thawing them first. I can't wait to try this. It's on the menu for this upcoming week. Kevin would this work with boneless chicken? Would I have to adjust the time? CharlesR: The recipe as written with boneless chicken.